Clarissa was born into wealth and privilege, as a child, shooting and hunting were the norm and pigeons were flown in from Cairo for supper. Her mother was an Australian heiress, her father was a brilliant surgeon to the Royal family. But he was also a tyrannical and violent drunk who used to beat her and force her to eat carrots with slugs still clinging to them. Clarissa was determined and clever, though, and her ambition led her to a career in the law. At the age of 21, she was the youngest ever woman to be called to the Bar. Disaster struck when her adored mother died suddenly. It was to lead to a mind-numbing decade of wild over-indulgence. Rich from her inheritance, in the end Clarissa partied away her entire fortune. It was a long, hard road to recovery along which Clarissa finally faced her demons and turned to the one thing that had always brought her joy - cooking. Now at last she has found success, sobriety and peace. With the stark honesty and the brilliant wit we love her for, Clarissa recounts the tale of a life lived to extremes. A vivid and funny story, it is as moving as it is a cracking good read. "Witty, eye-popping life story. ""Traverse City Record-Eagle""
A jolly good light read full of wit and a few surprises about her family life, the abuse from her father and her alcoholism. A honest autobiography. Really enjoyed this book - couldn't put it down. An extremely interesting life. Interesting account of early life and descent into alcoholism with amusing and insightful asides about life, love and interests. Thoroughly recommended. 5.0 out of 5 starsAn Excellent Insight into an Interesting Woman. While it may be true 'Rifling Through My Drawers' and 'Spilling the Beans' tend to share a few of the same story-lines from Clarissa's history, this woman's life is one of great interest and very many interesting experiences. I must admit I was a bit disappointed in the smaller role Jennifer Paterson played in these tales; however, in the grand scheme of Clarissa's life, Jennifer and the Two Fat Ladies represent a relatively brief period in an otherwise long and varied career pertaining to home and hearth. 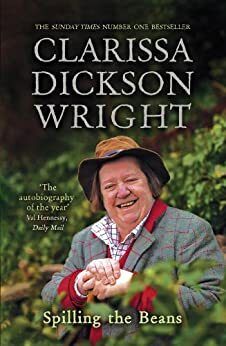 The editing and punctuation of Clarissa's autobiographies take a bit of getting accustomed to, but the books plug right along and are easy to get into. I recommend the American reader keep a tablet or computer nearby. You will need Google and Wikipedia rather frequently to look up and understand both the names of celebrities and those geographical locations that mean more to the British than they do to us. In any event, these books offer up a great deal of biographical context to help us understand why Clarissa is the way she is and why she has grown into the woman we've come to love. I loved Clarissa from , "Two Fat Ladies", a British cooking show series, in which she starred with Jennifer Patterson. The portrayal of her childhood, in this book, was riveting. It is so true, that the ones who suffer most from alcoholism, never touch a drop. Clarissa describes her abusive alcoholic Father in exacting and honest detail. Even though he was a renowned physician, he never sought help for his alcohol addiction. Clarissa shares her own personal journey through the quagmire of alcoholism. I found myself cheering for her to win her battle with alcoholism, from the sidelines as I was glued to this book. And like other fairy tales that come from our friends across the pond, the dragon was slain, and Princess Clarissa went on to live her life. In her honest portrayal of addiction, we are made to realize, there is no ed, at the end of recover, .....but an ing. She sought help, and found it. Thank you Clarissa, for using your pain to lighten the burden of others. Hopefully, this book and others, will help our society, face and address, the continued family terrorism, in America....that of alcohol addiction. Clarissa Dickson Wright was born into the upper class of British society. Viewed from afar, her life should have been idyllic -- money, position, famous father, etc. but the reality was quite different. Wright survived a painful childhood, became a barrister, but ultimately was felled by alcoholism and lost her career, her wealth, and her trim figure BUT she never lost her sense of humor or her tenacity to ultimately survive. Wright is a clever and funny writer who tells her story at a brisk pace. The reader is swept along as Wright's addiction swallows her life and we are carried out the other side of the abyss as Wright begins the journey from alcoholic to recovered alcoholic and on to her very successful career on television as one of the Two Fat Ladies. I admit to not being remotely interested in cooking and to have not seen her television program (which having read this book, I'm sorry that I haven't seen it) nevertheless, she is an interesting person and she writes entertainingly and unapologetically about her experiences on her life journey. She very effectively makes the point that AA helped her overcome alcoholism but she does it without ever appearing to be preachy. Clarissa Dickson Wright is a survivor and it's good that she chose to share her story. I first met Clarissa through the TV series, which I saw in England, and then found on DVD here in the US. Her comments and opinions intrigued me, and as I read bit and pieces about her life, I was even more interested. How did a chid of privilege, trained as a barrister, end up as a cook? This didn't compute, as they say. Well, there's a tale to be told, and she tells it, warts and all. I have tremendous admiration for her as she has faced her own demons more than once, and then shared her experiences with us in this book. I highly recommend it for many different reasons. It is a sociological study of family relations, it is an insightful look at addiction, it is a delightful romp through cooking and entertaining, and the story of one woman's redemption, who gets by with a little help from her friends. Kudos to you, Clarissa! I really liked this book, despite the fact that Clarissa rambles a bit. I was sort of like sitting down with a friend and catching up, with the sort of discursiveness that sometimes happens in that sort of conversation. This is a book with a lot of sad times interspersed with hilarious anecdotes. Clarissa is a woman of strong opinions. I don't always agree with her, but I think she'd be a lot of fun to have as a friend (seeing how I like friends with strongly held opinions). If you think the "nanny state" is a bad thing, thing that self-sufficiency and local production is a good thing, if you like good food, and a good tale you'll probably enjoy this book. Clarissa has managed to pick up the pieces of a life gone very wrong and come out on top. She hasn't come out on top in the sense that she's gotten rich or even enormously famous (far fewer people even know who she is than know who Brad Pitt is for instance). She's come out on top because she's found a way to live that is satisfying and which has made a difference to a lot of people. The stories of The Two Fat ladies videos make them even more fun to watch. I really wish there were a video series to go with her book on the green life. I'd really love to see Clarissa mucking about with the ducks and the chickens and making things in the old fashioned way.